Please note, registered Assistance dogs are not charged for. The site of the Burrow Wood Farm, including The Burrow and it’s garden, are on a gentle slope, as is much of East Devon. As a result there are a few different levels within the building and garden. We have tried to describe these to you, as best we can, below. Please use the description in conjunction with the site plan to make sure that we meet your requirements. Upon arrival at Burrow Wood Farm you come down a 50 metre tarmac and gravel drive. This is fairly flat, until it passes The Burrow on your left, when you then need to turn left, and go up an incline, to reach the parking area designated for The Burrow guests, which is situated just behind The Burrow. The main farmhouse is to your right as you pass The Burrow. Please see the site layout on this page to get your bearings. The main way to enter The Burrow’s grounds is from the gravelled parking area, through a wide 5 bar wooden farmhouse gate. This gravelled area has a small gentle slope, before you come to 5 very wide and deep steps down to the small gravelled courtyard area outside the front door. These steps are gravelled, with wooden sleepers at the front. Once you have descended, you find yourself in a small gravelled courtyard area outside the front door. Here there is flat access to the lower grassed garden area, which is more shaded than the upper area. Also here, there is one step up to the large open porch area, which is slate flagstones. There is room enough to sit out here in the shade. There is then a small doorframe lip to pass over, to access in to the main living area. Upon entering through the main door, you are straight in to the main open-plan living /dining area, with the kitchen further beyond. It is a very light and airy space, with high ceilings, and a wooden floor. The kitchen area is open-plan at the end of this room, with wooden floors. As well as the usual appliances, there is a washing machine and dishwasher. The fridge/freezer is full hight, with the fridge to the top half, so there is no bending involved to access the fridge, although there will still be some with the freezer. This living/dining/kitchen space is all on the same level. Half way through this room, to the right, can be found the steps which lead down to the hallway, and on to the bedroom areas and bathroom. The steps are slate topped, with a slight lip to each edge. There are 3 steps in total, and there is a handrail to the right-hand side as you go down. The hallway has a wooden floor, and is slightly wider than average. The first door to the right is the twin bedroom, again with wooden floor. These are the lowest beds in The Burrow, and would be more suitable for someone who found it difficult to get in to a higher bed. The next bedroom is to the left down the hallway, and contains a kingsize iron-framed bed. It also has a wooden floor. The main bathroom is the second door to the left. It is large and roomy. There is a bath, with a shower over, and also a handheld shower head. The flooring is slate, and it has under-floor heating. There is plenty of room around the toilet to one side, so it is quite accessible. The main bedroom is the second door on the right down the hallway. It also has wooden flooring. There is a super-king four-poster bed, but it is exceptionally high, and could be very difficult for less able-bodied people to get in to. From the main bedroom, the en-suite can be accessed. This has a limestone floor with under-floor heating. There is a large walk-in shower, which has a small lip upon entry. We are able to provide a showering stool if required, please ask at the time of booking. From the main bedroom there are French doors to the outside. They would both need to be opened to enable someone to comfortably go in and out. Inside, there is one small step down, a small step down again, and then you are on to a large slate slab. Another step down gets you to the lower courtyard, which is gravelled, and has a table and chairs for seating. It is quite sheltered. There is also a back gate here. This leads out in to the main driveway of The Burrow. It is possible to use this gate for access, if you have less mobile guests, as then it cuts out the large steps down from the parking area. (it means entering The Burrow via the French doors to the main bedroom). Please discuss this with us, if you feel it might be an option you require. We are also able to accommodate one car for parking within 5 metres of this back gate, for less able bodied guests. Again, this needs to be confirmed at the time of booking. There are 3 steps in the lower courtyard area, which lead back up to the area you first descended to, before entering The Burrow. The steps are sleeper fronted, with a gravel infill, and are quite steep. The Burrow is contained within its own large private garden. There are two separate grass levels within its grounds. The lower garden is more shaded than the top. We are happy to move garden furniture in to the shade here for you, if you do not want it in the sunnier areas in summer. Please ask prior to arrival. Both grass levels are fairly flat, but we are not always able to keep the grass very short, especially in the winter when it is wet. Generally it is mown and short, apart from these times. There is also a large sun deck on two levels in the garden. The lower level can be accessed via a gently sloping gravel path, which leads to a gravelled sitting area, where the gas BBQ can also be found. The upper level has 4 steep steps with no handrail, so would be very difficult to access for less able-bodied guests. Again, we are happy to relocate the sun-beds found here to elsewhere in the garden, so you can still enjoy them. We are always happy to answer any further questions or queries you may have as to accessibility. 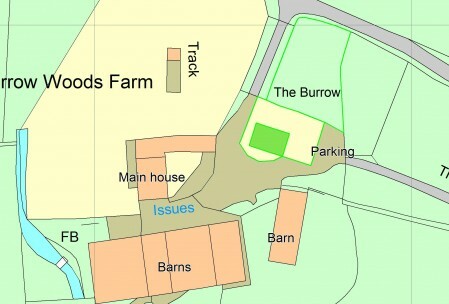 The Burrow and it’s gardens are indicated in green.